I feel like maybe I'm not posting this in the right place. Mods, move as appropriate. 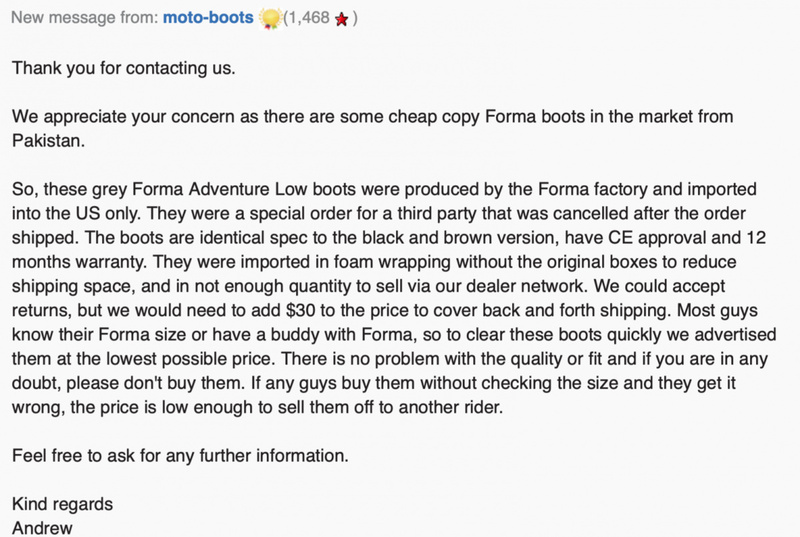 I just wanted to give a heads-up on what looks to be a really good deal on Forma Adventure Low boots on ebay. These normally run $239 pretty much everywhere, but this listing has them available at $150. I guess these are surplus stock, and they are a "limited" edition dark grey color (normally they're only available in brown or black). I ordered a pair, and I have my fingers crossed that they turn out to be what they seem to be. Seems like a pretty good deal. I've got a pair and like em. Easy on and off and reasonable protection and quality. And can go walkies in them. I have a pair as well and they are great. They are comfortable and supportive, and I can walk in them easily. It would take a fairly unique accident to cause an injury that would not have occurred with full length boots. Great find. They even have the bigger sizes in stock. On paper, these are exactly what I'm looking for. I have large-ish calves, so full height boots are generally uncomfortable for me. Also, per the reviews I've read, these run towards being wide, and that suits me as well. The downside in this case is that the seller stipulates no exchanges or returns at this price. So, if they don't work for me, I'm stuck with 'em. Fingers crossed. Thanks for the heads-up, Scott. I had kicked around getting a pair of these for a while. But for a buck fifty? Trigger pulled. I've had Forma Terras for almost 4 years and I absolutely love them, but sometimes I just don't want to wear the heavy full height boot. Looking forward to seeing them. Hmmm... how do we know they are not knockoffs? I don't have much experience with ebay. I suppose since you can't return them, you're taking your chances with the quality/fit. That's the only thing holding me back right now. One positive is the ebay seller has high ratings, so that would seem to indicate it's all legit. I've had the Forma Adventure high boots since last fall (from Motostorm in Italy), and I absolutely love them. Buckles are easy and work well. Boot is super comfortable, and nice and wide in the toe box for Sasquatch-wide tops of the feet like mine. Boot quality seems top notch. Everything on it just screams "We take pride in crafting these boots." It feels great for this newbie to have my feet protected by real riding boots. By the way, the Forma fit guide was spot on for me. You can find it on Revzilla if you look at any Forma boots. Just be aware that you may need to adjust your shifters a little to compensate for the higher height near the toe area for these Formas. I had to because I have been using cruiser type boots. Brockie and America First like this. Good point- I forgot about that. That happened with me; once I rode with these boots, my shifter was too low (uncomfortably low), and I had to have the shifter raised. All good now. For what it's worth, I contacted the seller with a question about how we can be assured these are not knockoffs. Here is the reply I just got, below. I ordered a pair. We'll see how they look when I get them next Friday or so. Big B, IDRIDR, ScottKY and 1 others like this.